Shoddily run, with the barest nods to safety from both the park’s staff and visitors, Action Park was responsible for a staggering amount of injuries and several confirmed deaths, and if you grew up in the area in the ’80s or ’90s, it was the most fun place on earth. But upon entering, you were confronted with the looming hulk of Cannonball Loop, a water slide that put riders through a complete vertical loop. It was never open. You wondered if it had ever been open. 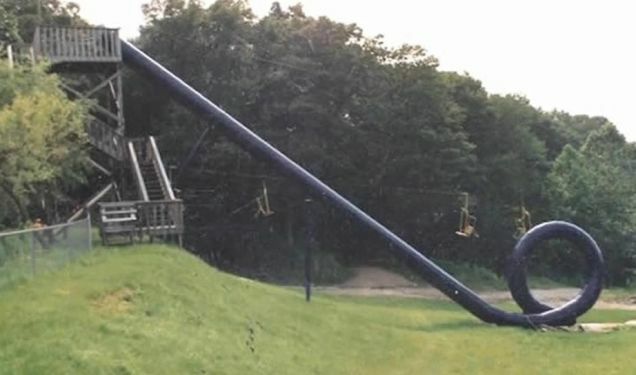 The video above, a compilation of commercials and early home movies of Action Park, was recently uploaded to Youtube. It claims to be the first footage of Cannonball Loop in action. I don’t know if that’s true, but at the 8:17 mark, you’ll see a couple of riders enter the slide, and somewhat miraculously, come out at the bottom. I remember one person getting stuck in the tube because instread of riding down with her feet crossed and arms folded across her chest she put them out and braked then didn’t have the speed to get around. That is why they built the hatch at the bottom of the slope. I was one of the idiots that accepted you-know-who’s crisp $100 bill to test run it. That was my last ride. $100 did not buy enough booze to drown out that memory. I vividly remember the sensation of my feet going up as I realized “Here comes the loop!” I remember being ecstatic when I had cleared the pinnacle of the loop, however the worst was yet to come. Apparently my sub 100 lbs. body was not heavy enough for the ride and rather the sticking to the slide on the back end of the loop, I actually fell to the bottom of the loop. I smacked the back of my head on the slide and was nearly knocked unconscious. It was then I saw light as I sputtered out of the exit of the tube […] I was able to orient myself enough to get to my feet and smile with pride as the stunned crowd cheered for the little kid who just went down the most dangerous water slide of all time. It was closed again within minutes and although I went to the park a dozen times after that day I never saw that slide opened again. Previous Bill Clinton Confirms Weapons of Mass Destruction in Iraq: Was Bush Right All Along?